If you are still working on your Thanksgiving menu and looking to firm up your holiday plans, we’ve got you covered! We’ve scoured the web to round up the most wicked awesome, plant-forward suggestions for the table: five mighty mains, eight stellar sides, three light bites, one boozy option and even an idea for Thanksgiving breakfast to tide you over to dinner. 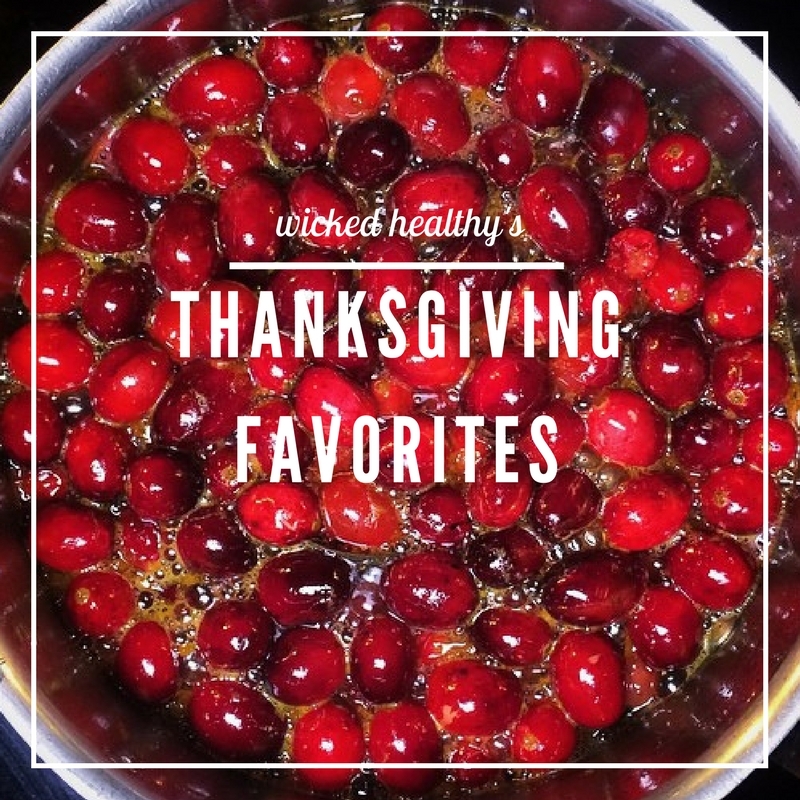 Everyone here at Wicked Healthy wishes you and your friends+family a Happy Thanksgiving! Maitake Mushrooms | Make shrooms the center of it all this Thanksgiving! 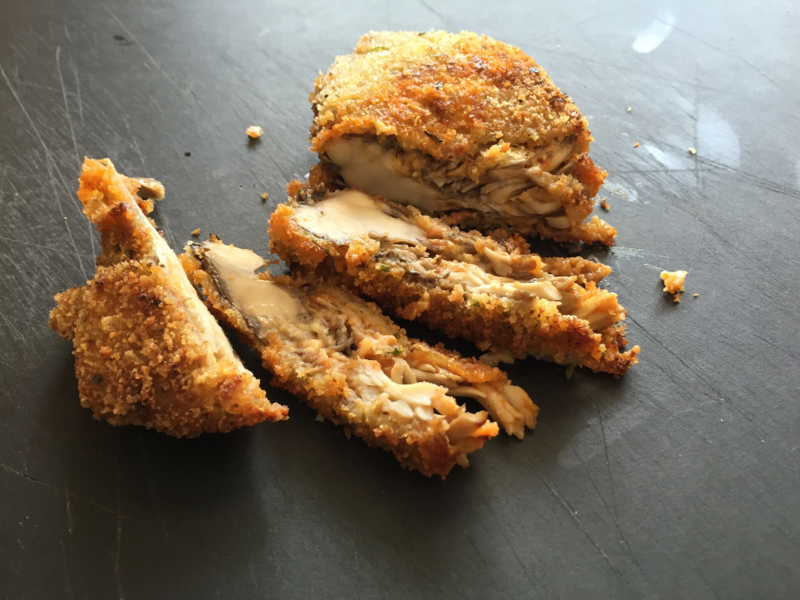 Our pressed and breaded maitakes are always a good idea. Try our alternate idea for breading here for a delicious, cruelty-free tradition. 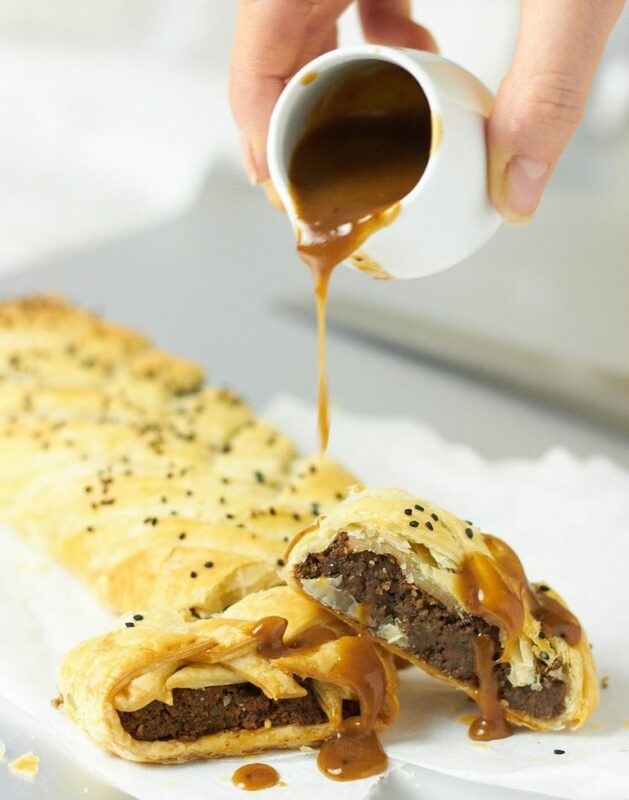 Pecan and Mushroom Wellington | We love how Katie over at Delightful Vegans whipped up this elegant but doable center masterpiece, which can be made with your choice of mushroom. We’re loving the criss-cross pattern of that pastry, and this picture makes us want to reach in and grab a bite! 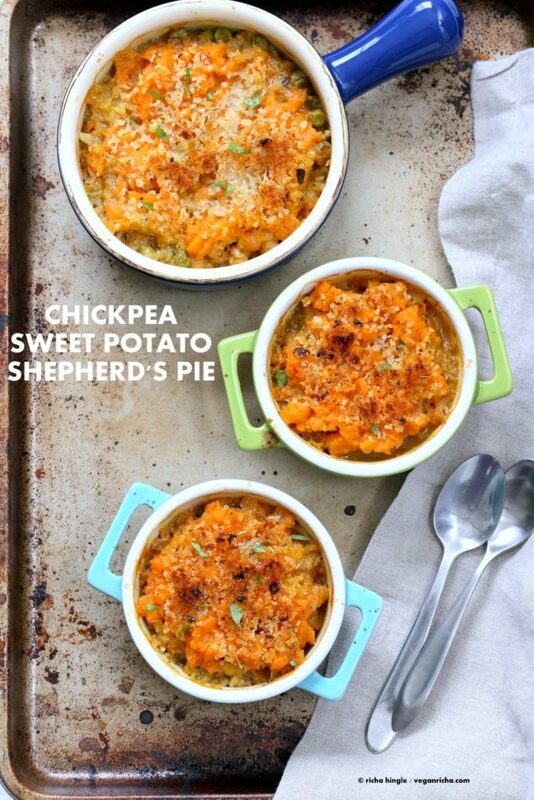 Chickpea Sweet Potato and Shepherd’s Pie | Richa always stuns us with her creative but quick and easy dishes, and this shepherd’s pie is no exception. This dish can be made in one hour, and is packed with chickpeas, sweet potato and your choice of veggies, served up in a ramekin or soup crock. 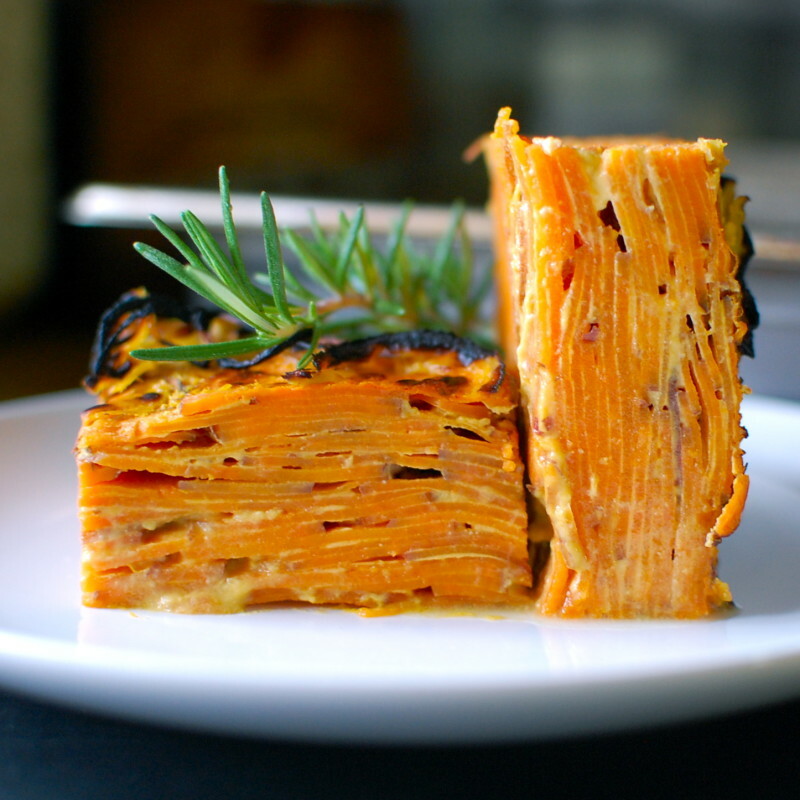 Vegan Lasagna | SunnysideHanne whipped up this gorgeous, colorful layered masterpiece, and we’re loving this idea that sways a bit from traditional Thanksgiving fare. 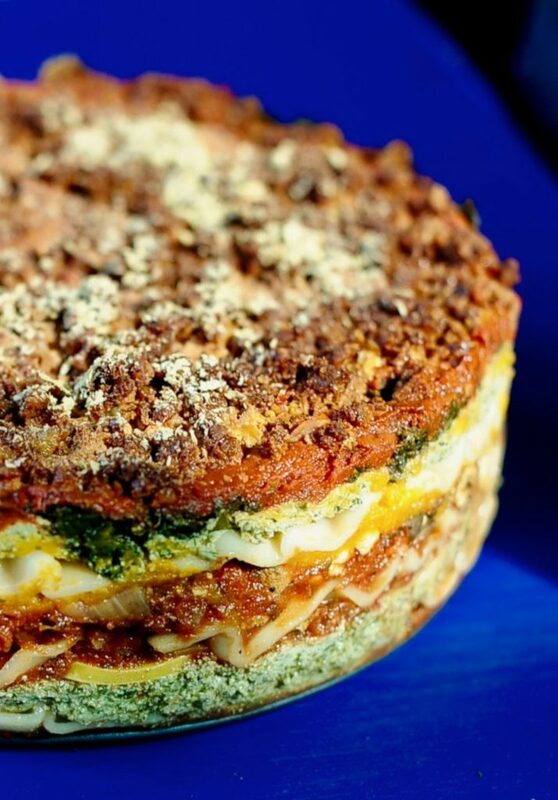 Shrooms, spinach, squash, onions, “beef” crumbles and plant-based cheese are layered to make this decadent tower of deliciousness. 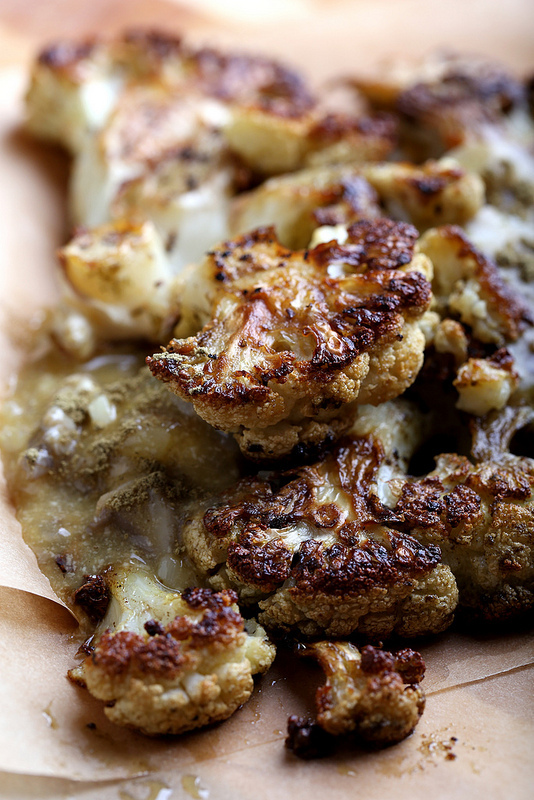 Roasted Cauliflower Steaks | Erin over at Olives for Dinner whipped up this idea for those travelling for Thanksgiving. This portable, low-maintenance dish is a great solution, but also doubles as a good main dish if you decide to stay put this holiday. Plus, shroom gravy! 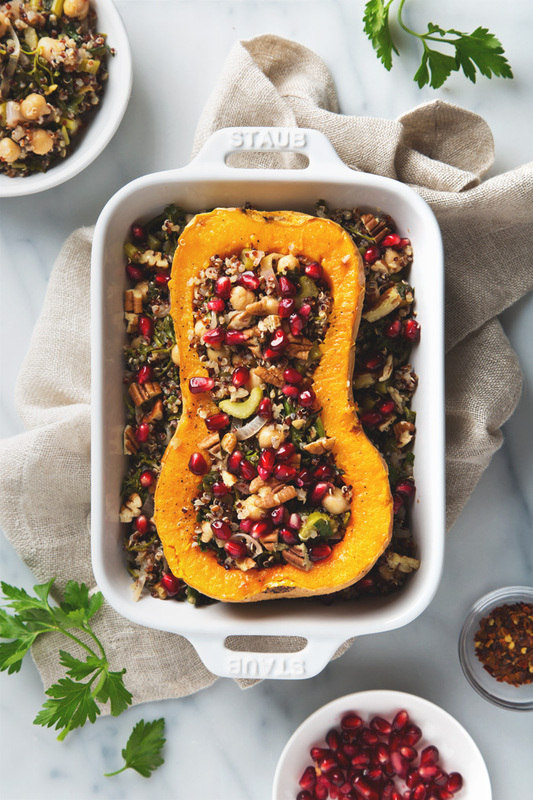 Stuffed Butternut Squash with Quinoa Salad | Amanda over at Pickles & Honey calls this dish “comfort food minus the food coma” and we love it! The quinoa salad portion can be made in advance, simplifying your prep plans without sacrificing on flavor or creativity! 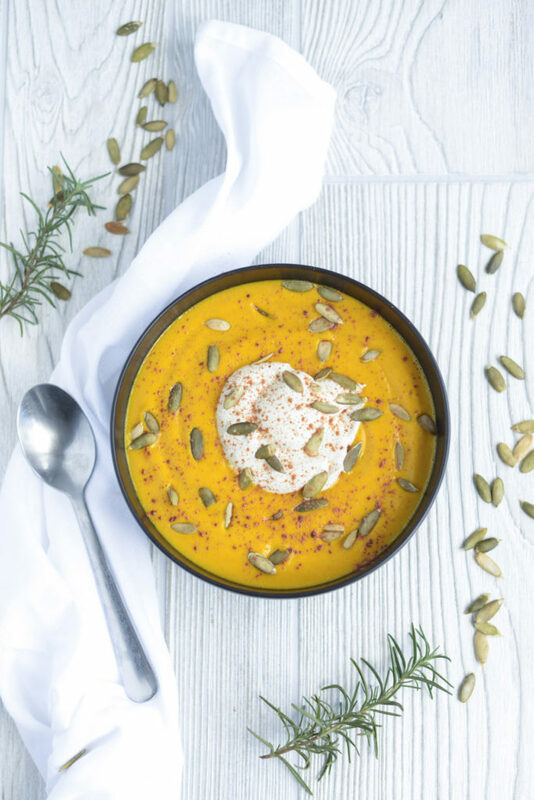 Winter Squash Soup | How gorgeous is this winter squash soup from Kelly over at Appleseed Cuisine? Topped with pumpkin seeds and homemade cashew sour cream, this is perfection in a bowl! 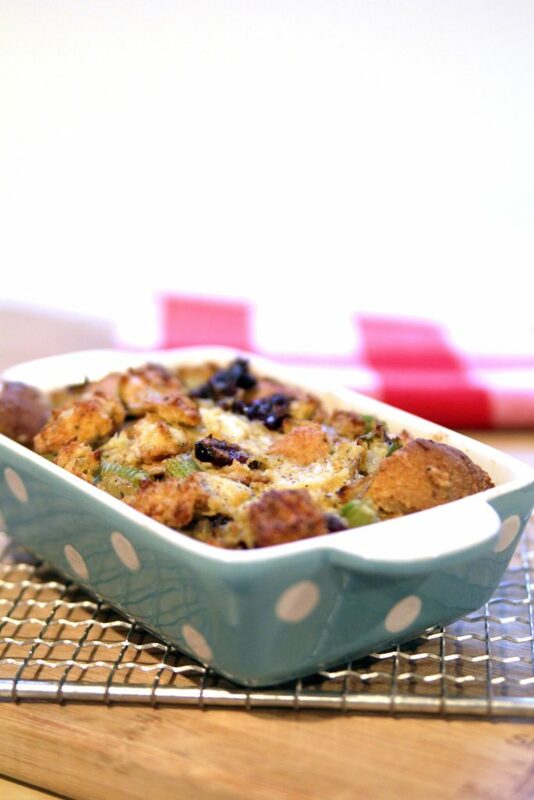 Thanksgiving Stuffed Casserole | There’s nothing more classic for the holidays than warm and herb-scented stuffing, and Julie over at Julie’s Kitchenette (the master of casseroles and comfort food) has whipped up this beauty, packed with onion, sage and majoram … and can also be made gluten-free! 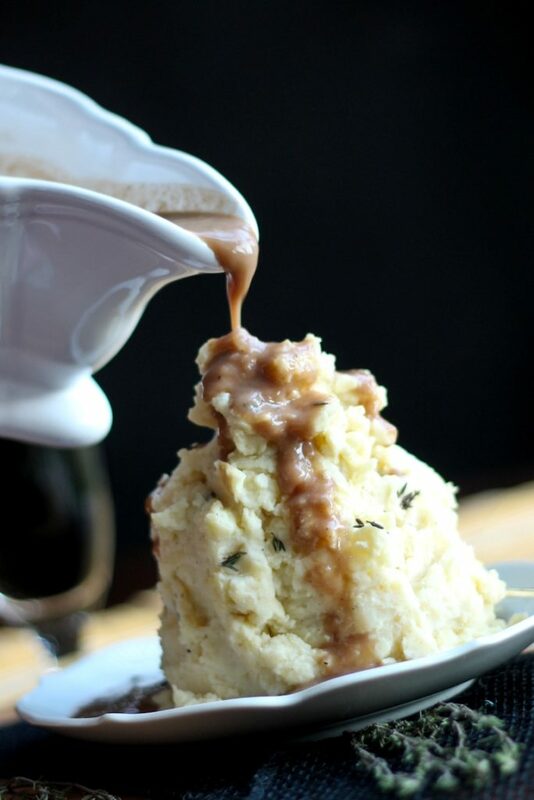 Fluffy Buttermilk Mashed Potatoes | Mashed Potatoes are a must for the Thanksgiving table, and we love this fluffy little stack of them, brought to you by Brandi over at The Vegan 8. Brandi uses a combo of yukon gold potatoes and coconut milk with a hit of apple cider vinegar to create a “buttermilk” flavor that will keep you coming back for more. 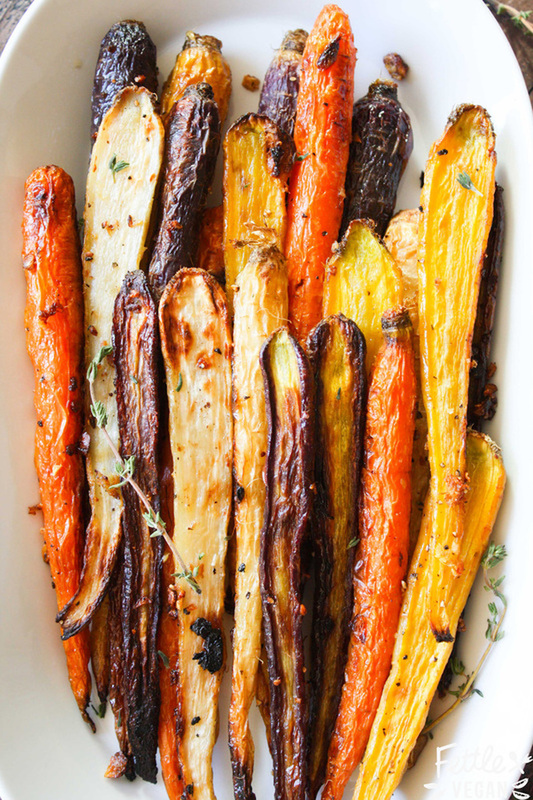 Ginger Garlic Roasted Carrots | Amber over at Good Saint has our attention with these garlic and ginger kissed baked carrots. We love the gorgeous color and texture, and that these are savory instead of sweet. 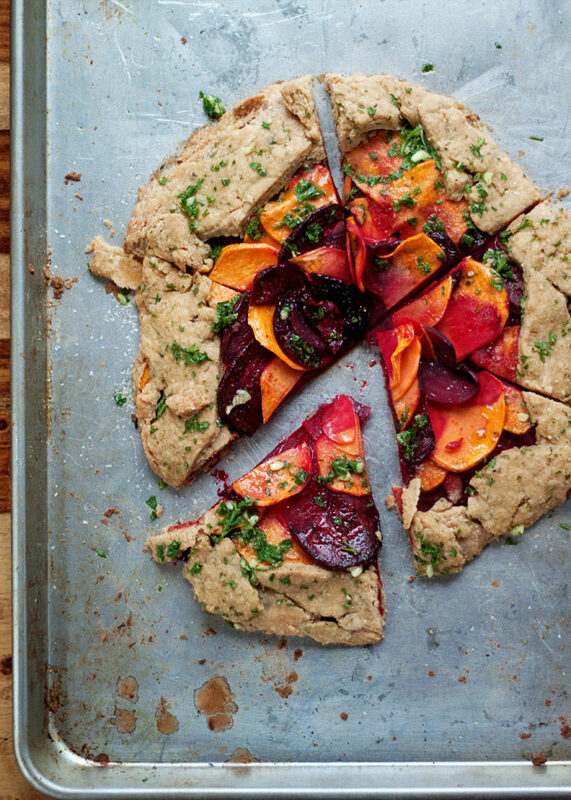 Rustic Sweet Potato and Beet Galette | Kare over at Kitchen Treaty put together this beautifully rustic and vibrant galette, packed with mandolined sweet potato and beets enveloped in a whole wheat crust and baked. The sprinkle of fresh parsley at the end adds a fresh, homey feeling and makes this tart pop. 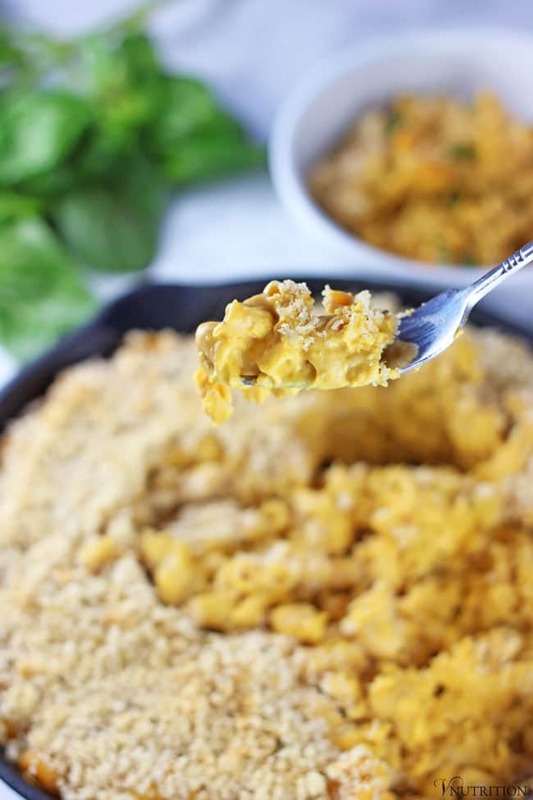 Baked Pumpkin Mac and Cheese | Gluten- and dairy-free mac and cheese? Yes please! Mary Ellen has cracked the code here with this creamy and indulgent year-round favorite. Check out VNutrition for more comfort food favorites! Miso Sweet Potato Pie | We featured this dish a couple of years ago, and it uses a blend of onion, ginger, lime, rosemary and miso that gives a holiday feel with a little extra east asian flavor thrown in. Savor the layers! 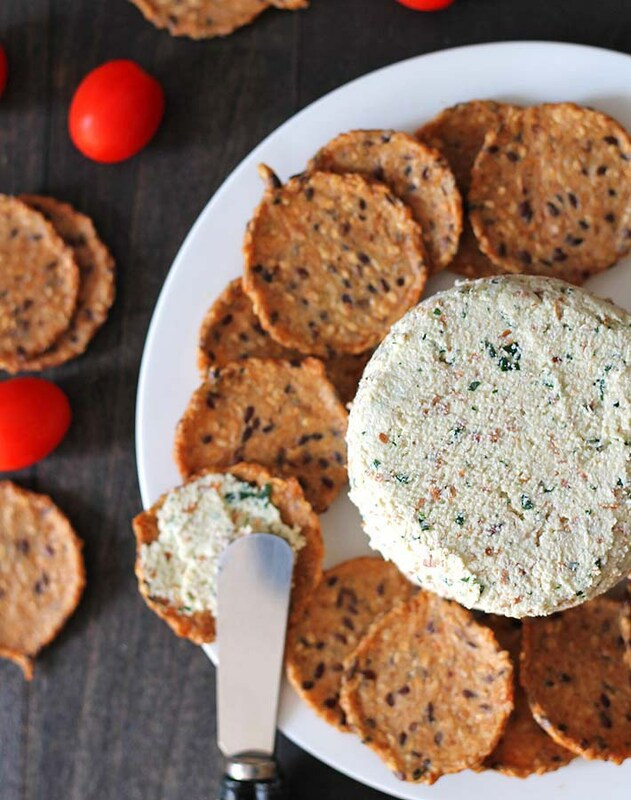 Garlic Herb Almond Cheese Spread | Delightful Adventures has whipped up this cheezy spread that’s a perfect light snack for Thanksgiving day. Gwen’s version is cashew-free, packed with fresh herbs, and can be spread over crackers, used as a sandwich spread or a dip for veggies. We love that! 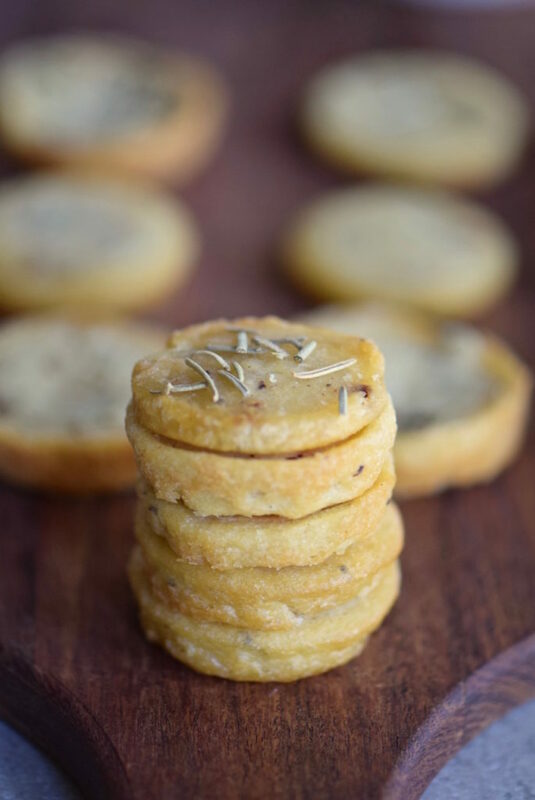 Rosemary Socca Rounds | If you are looking for a gluten-free option to use with a spread or dip, these protein-packed socca rounds by Kelly over at Tasting Page look like a tasty solution! 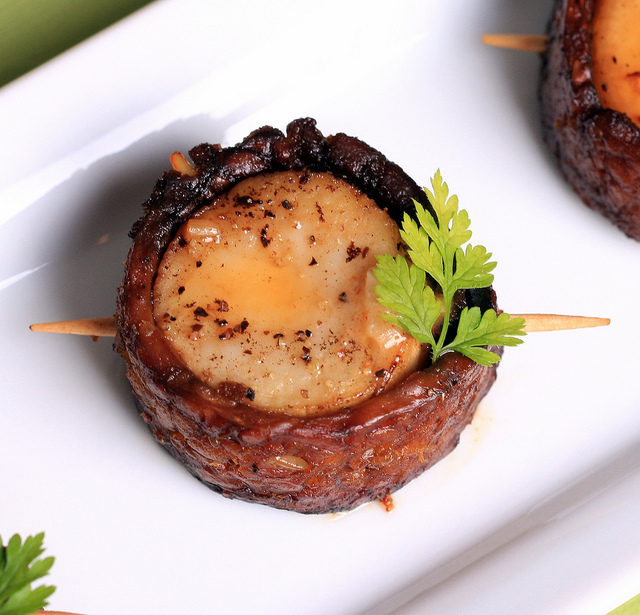 Tempeh-Wrapped King Oyster Mushrooms | A play on bacon-wrapped scallops, these one-bite apps from Olives for Dinner are fun to whip up, and won’t leave you stuffed before the big meal. Bourbon-Spiced Cider Punch | Cocktails, anyone? Serena over at Domesticate Me used a blend of spiced apple cider, bourbon, lemon and ginger beer to make this gorgeous cocktail. 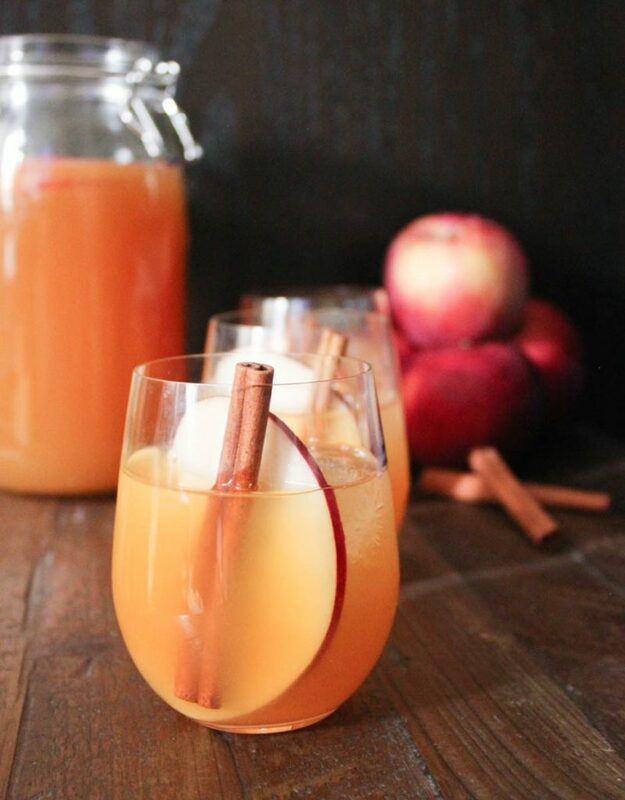 We love the addition of apple slices and a cinnamon stick to add that holiday warmness and feel. 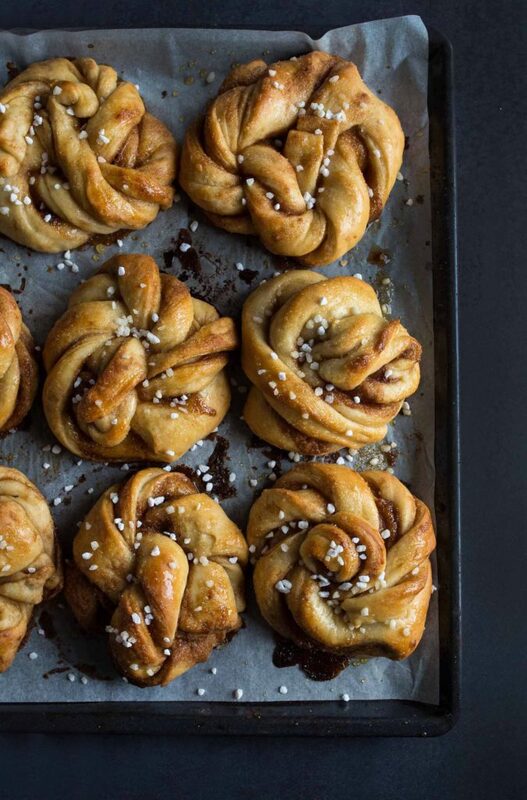 Cinnamon Buns | If you are looking to start your Thanksgiving morning off with a bang, may we suggest these beautiful cinnamon buns by Lara over at Vanillacrunnch? Want to know how to assemble and arrange these beauties? Lara has included a great illustration in her post that shows you how.